Knights and Ladies of the Holy Sepulchre attend the Investiture Mass at St. Patrick’s Cathedral on Oct. 31. Cardinal Dolan makes sign of the cross on the forehead of a Lady to be promoted in the order. Knights approach the altar rail to be dubbed and conferred the Jerusalem Cross, the insignia of the order. Cardinal Dolan welcomed 93 new Knights and Ladies of the Equestrian Order of the Holy Sepulchre of Jerusalem’s Eastern Lieutenancy of the United States at the order's annual Mass of Investiture Oct. 31 in St. Patrick’s Cathedral. Seven of the new members are from the archdiocese. Additionally, there were 66 promoted members, eight of whom are from the archdiocese. The Equestrian Order of the Holy Sepulchre of Jerusalem is dedicated to supporting the Latin Patriarchate of Jerusalem and responding to the needs of Catholics in the Holy Land. The order’s members aid Catholics in the Holy Land by raising funds for seminaries, schools, hospitals and orphanages. The order originated in the 11th century, from the time of the First Crusade in 1099, when Godfrey de Bouillon reclaimed Jerusalem and the Holy Lands from the Turks and established a guard of honor to protect one of the region’s most sacred sites—the Church of the Holy Sepulchre. In addition to safeguarding the tomb of Christ, its members were charged with providing assistance to pilgrims. Cardinal Dolan, who serves as grand prior of the order’s Eastern Lieutenancy, was principal celebrant and homilist at the afternoon Mass in the filled cathedral. As part of the rite, the newly invested knights and ladies approached the steps of the altar where they were greeted by the cardinal. There, the cardinal held a ceremonial sword as the inductees bowed their heads. Then, with a gentle motion, he tapped the shoulders of each knight, making an invisible sign of the cross with the sword. Ladies were received with a sign of the cross on the forehead. All the newly invested knights and ladies were then bestowed the insignia of the order of their rank, presented in a red gift box. Cardinal Dolan, in his homily, said those who are followers of Jesus show their personal identity through the cross. “From the moment of our baptism we are sealed with the sign of the cross. The first thing we start our day with is the symbolic gesture of making the sign of the cross. Every prayer that we begin starts with the sign of the cross. Before we go to bed, we cross ourselves. The robes of the knights and ladies are adorned with the Jerusalem Cross, which contains a crossbar at the end of each crosspiece. It is also known as the Cross of Godfrey of Bouillon because it is believed he was the first to carry it into battle. 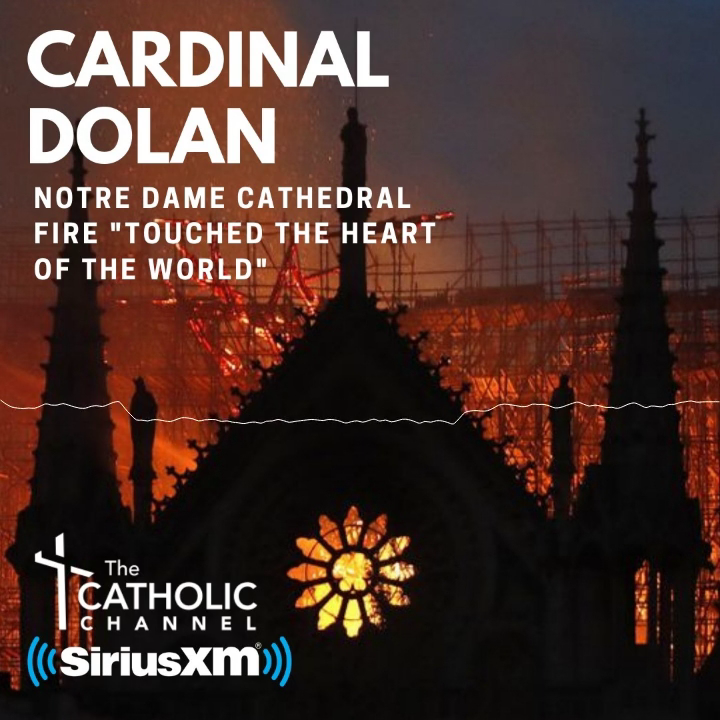 Cardinal Dolan said the red cross insignia reflects what the order stands for—protectors of the Holy Cross. Bob Sitler, a parishioner of St. Mel’s in Flushing, Queens, has been a member of the Holy Sepulchre for nine years and now holds the rank of Commander with a Star. Linda Keppel, also of St. Mel’s parish, became a member of the Holy Sepulchre eight years ago and holds the rank of Lady Commander with a Star. She feels the order forges unity among Catholics. “Celebrating the Eucharist takes you to a different level in your faith and in your spirituality,” Ms. Keppel said. The investiture liturgy at the cathedral, and the banquet that followed in the Grand Ballroom of the Waldorf Astoria in Manhattan, were sponsored by the order’s Eastern Lieutenancy of the United States, which comprises New York, Connecticut, New Jersey and Pennsylvania. New members invested include two auxiliary bishops from Rockville Centre: Auxiliary Bishop Nelson J. Perez and Auxiliary Bishop Andrzej J. Zglejszewski, both of whom hold the rank of Knight Commander With Star. A Priest Knight from the archdiocese was invested: Father Robert Bubel, administrator of St. Mary St. Peter parish, Kingston. New Knights from the archdiocese are Dr. Thomas Caputo of St. Catherine of Siena parish, James DeSilva of Holy Innocents and Thomas Travers of Our Saviour, all of Manhattan, and Joseph DeBono of St. Francis of Assisi, West Nyack. New Ladies from the archdiocese are Mercedes Alvarez of St. John the Evangelist parish and Joan Stout of Epiphany, both of Manhattan. Promoted to Priest Knight Commander was Father Brian T. McSweeney, pastor of St. Augustine, Ossining. Promoted to Knight Commander was Thomas A. D’Auria of Hawthorne. Promoted to Lady Commander was Janice M. Moore-Smith of Yonkers. Promoted to Knight Commander With Star were Francis D. Coleman of Crestwood, Michael J. L. La Civita, communications director for CNEWA (Catholic Near East Welfare Association) and James J. Spach of Staten Island. Promoted to Lady Commander With Star was Mary Dale Spach of Staten Island. Promoted to Knight Grand Cross was James M. Hughes of Yonkers. Promoted to Lady Grand Cross was Marcia Henderson of Manhattan.